By nature, Python is a linear language. It's often not feasible to execute a process when the request is received (especially when dealing with I/O) to prevent the thread from blocking incoming client requests. This requires an asynchronous strategy which uses queues to maintain a list of background tasks. Workers can be used to execute these tasks in the background. They run concurrently with the main process and execute the tasks present in the queue chronologically. This modular approach prevents the main process from becoming blocked. Task queues are popular among microservice architectures because they enable each microservice to perform its dedicated task and they work as a medium for inter-microservice communication. These queues store messages or data incoming from producer microservices which can be processed by consumer microservices. This is a guest post brought to you by your friends @ Timber. Though our product doesn't have anything to do with task queues, we're a company that is trying to reinvent logging. You should check us out. We will be writing a flask-based web application which retrieves Goodreads book information like title, author, rating, and description. We'll write a function to crawl and parse the URL for the book's meta information. Since the function will take time to execute, we'll execute it asynchronously using Redis Queues (RQ) to prevent it from blocking the main thread. Redis Queue's allow you to enqueue function calls which can be executed in parallel by separate worker processes. They require a Redis server as a message broker to perform this operation. You can use the starter repo here to follow along. It requires Docker to be installed on your machine. you can head out here and install the relevant version. Start the Docker daemon and run docker-compose up --build to start the application. This launches two containers, the web server application and Redis server interlinked using Docker networking. The --build argument ensures the image is built using the latest code every time. Visit localhost:5000 in a browser to make sure the web service is working. 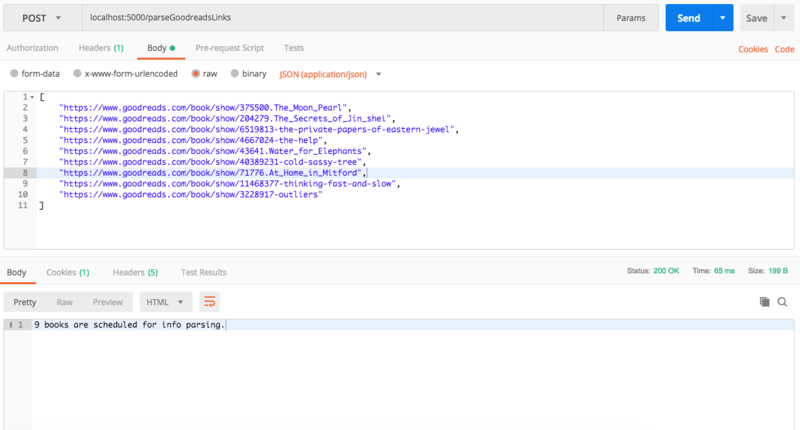 We'll use the requests library to make an HTTP request to GoodReads. 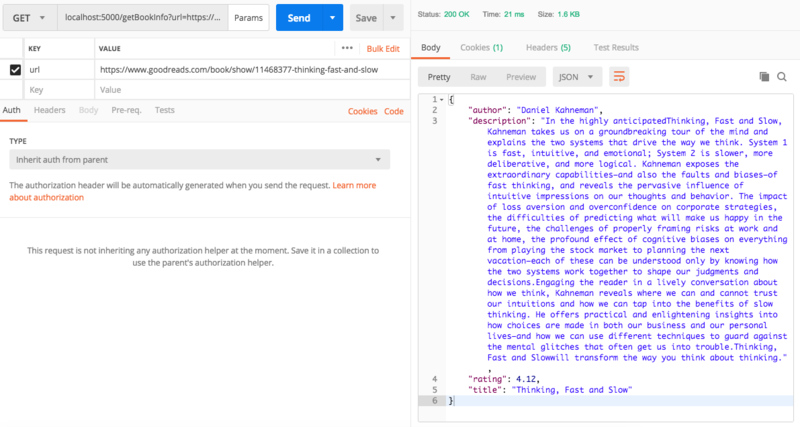 BeautifulSoup allows us to search, manipulate and create structured markup languages to retrieve critical information such as the title, author, rating, and description. Now we can write a function called parse_and_persist_book_info to parse the above function and enqueue the value to the RQ for the worker processes. generate_redis_key_for_book generates a unique key for a given book URL, since Redis is a key-value store that requires each key is unique. # will return the key as "GOODREADS_BOOKS_INFO:https://www.goodreads.com/book/show/6519813-the-private-papers-of-eastern-jewel"
# returns a python dictionary. 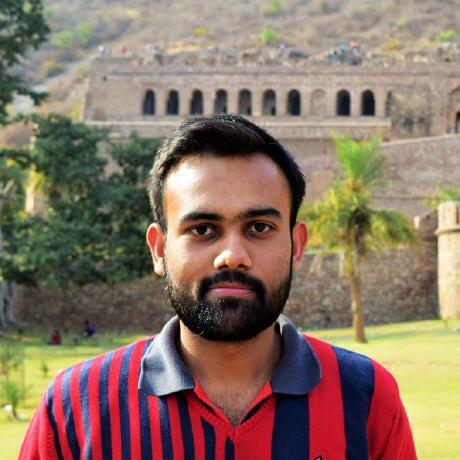 # Here pickle module is used to serialize python objects. After validating the GoodReads URL, they are pushed to the RQ to parse the information. Here the method enqueue_call takes in a function that will be executed by a worker process. The returned response specifies the number of jobs scheduled. We need to open an endpoint that will accept a url and request the Redis Server for the book information. return "No meta info found for this book." rq-dashboard can be used to check the state of Redis queue. The dashboard provides an intuitive interface for visualizing the queue in real-time as tasks are scheduled and executed. 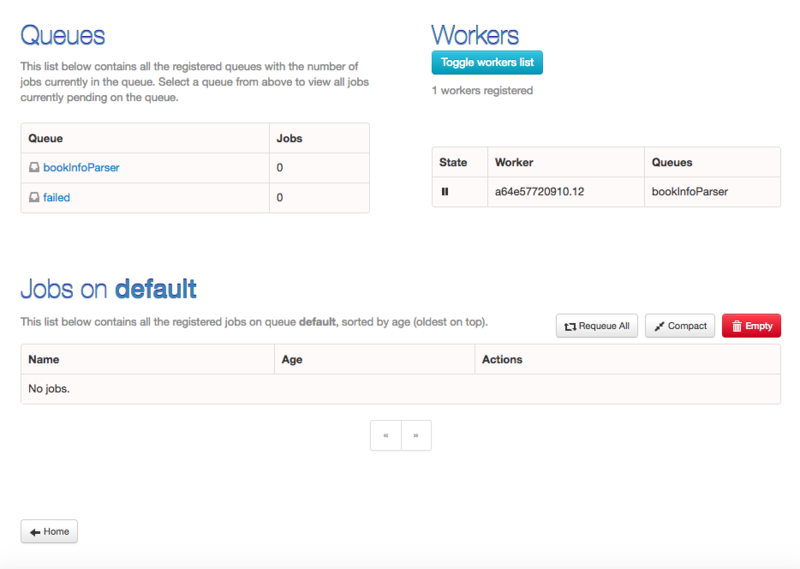 It provides triggers to flush the queue and re-queue failed jobs. In case of a task failure, it prints out the error trace. Let's integrate it with our application. Now, all we need to do is test the application. We can do this using Postman to make the API request. 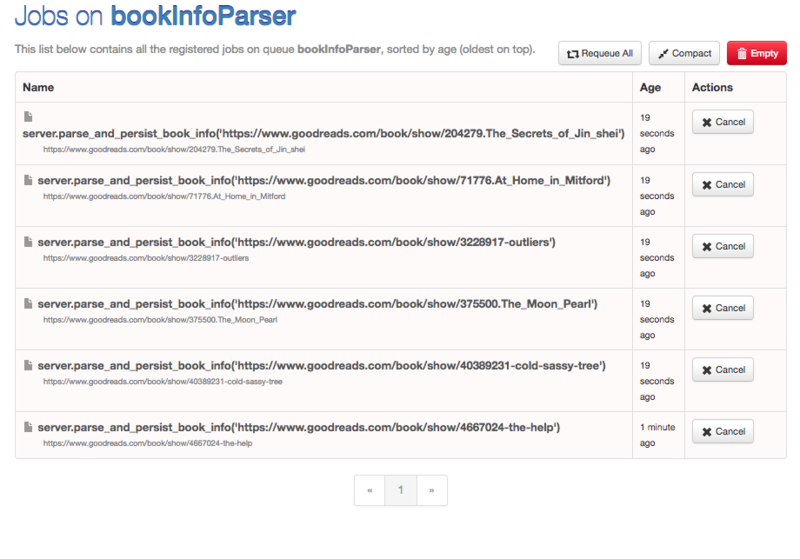 Let's start by making a POST request to /parseGoodReads endpoint. Make sure to provide a valid list of URLs in an array. We can check for the tasks scheduled by navigating to the rq dashboard endpoint /rqstatus. Once the queue empties and all tasks are executed successfully, we can check for the meta information. Make a GET request to /getBookInfo endpoint with a URL from the POST request, and you should receive a JSON object containing the title, author, rating, and description. The above application demonstrates Redis Queues can be leveraged to approach problems asynchronously. Since concurrency isn't native to Python, it's important to understand both when it's necessary and how to use it. If you want to learn the difference between multiprocessing and threading, it's one of our most popular guides. Queueing frameworks provide a granular control over scaling because worker processes can be spawned if there is an accumulation of tasks in the queue. Multiple queues can be used to handle different type of tasks. Tasks can send information on their status to Redis, bringing insight into the task. Though powerful, Redis Queues aren't the only task-queueing framework. This is one of the most popular tasks queuing frameworks in Python. It has wide community support and is recommended for high-velocity production applications. It offers both asynchronous and synchronous mode with support of multiple worker processes. RabbitMQ, Redis, Beanstalk are some of the message brokers supported. Amazon Web Services (AWS) provides a fully managed queuing service called Simple Queueing Service. It can be readily used with any existing application without the need to deploy or manage the service. AWS provides SDKs for popular languages making it a language agnostic solution. They've recently started supporting AWS Lambda, making it suitable for a serverless architecture.